The Berlin InvenTeam advanced to round four of the TI CODES Contest and was one of five teams to move on based on their video submission. A public vote was held, and Berlin InvenTeam was awarded the Grand Prize. Congratulations to team members: Melanie deLaurentis, Greta Hermann, Kaley Culbertson, Justin Hall and Gabriel Hemendinger. The TI-Codes Contest challenged students to identify an everyday process that could be automated, design the enhancement, then use Texas Instruments technology to build a model of the solution. The Berlin InvenTeam’s winning solution solved the problem of compromised indoor air quality due to volatile organic compounds. 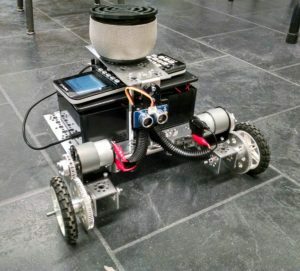 Their device was an autonomous robot that detects noxious fume and cleans the air; it consists of a robot chassis with an air filtration unit which travels the room until the particle sensor minimum threshold is reached, at which time, the device, including the air filtration unit, turns off. As Grand Prize Winner, each member of the team will receive a TI Graphing Calculator, a TI Innovator Hub, a TI Rover and a #Gen-Stem tee shirt and as the teacher/mentor, Dawn Wetmore will receive a $250 Amazon gift card for use in the classroom.